If you are installing a new inground swimming pool there are many options when it comes to choosing building materials. The top choices are fiberglass pools, gunite pools and concrete pools. Concrete makes an outstanding building material for inground swimming pools because its durability is unmatched. When installed properly, a concrete pool will last indefinitely. Unlike other pool choices your options for design are limited only by your imagination. Because concrete is installed on site instead of being pre-formed at a factory, you can make allowances for terrain that would otherwise be impossible. Concrete swimming pools are themselves the least expensive pools to build. The installation of a concrete swimming pool also requires the least amount of terrain prep work than any other pool building material. This adds to the cost savings. You are not limited in color as you are with other building materials. You can paint the concrete any color that you choose, have a design painted, have a design stamped into the concrete or even use a vinyl liner. If you wish to change the color or design at a later time, it’s as easy as repainting the pool or changing the liner. Paint considerations for concrete pools are now limitless. Any color can be mixed into a paint formula suitable for pools. No other building material allows for the kind of creativity with paint that concrete allows. Concrete pools are also the easiest pools to tile. This is important if you want a mosaic design. This can be done at installation easier than with any other building material. 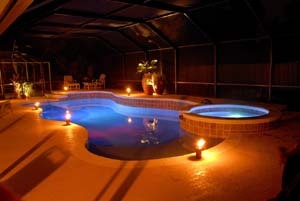 The installation of vinyl liners is also easier in concrete pools than in other types of pools. This is because vinyl liners were originally designed for concrete pools. These can be installed professionally or personally. Concrete pools are also easier to clean than other building materials owing to the simple fact that they are so durable. While many people choose to clean by hand, concrete pools are not limited to this option. Some pool cleaners and vacuums that are more likely to damage fiberglass and gunite pools are perfect for concrete swimming pools. Concrete is also the least likely to be negatively impacted by the use of chemicals in the pool. Overall it is a matter of preference as to what material you ultimately choose to use when creating your new inground swimming pool. When taking all factors into consideration concrete is clearly the best building material in terms of durability, design and cost.